Full-time minimum wage workers in Colorado take home less than $300 per week — not nearly enough to cover rent, pay bills and put food on the table. And yet that’s exactly what minimum wage workers, most of whom are adults, are trying to do. In Colorado, 86 percent of the workers who would benefit from a proposed minimum wage increase are age 20 and older. Almost two-thirds of them are age 25 and older. And more than one-fourth of them are parents, trying to stretch their limited, hard-earned dollars to feed their families. 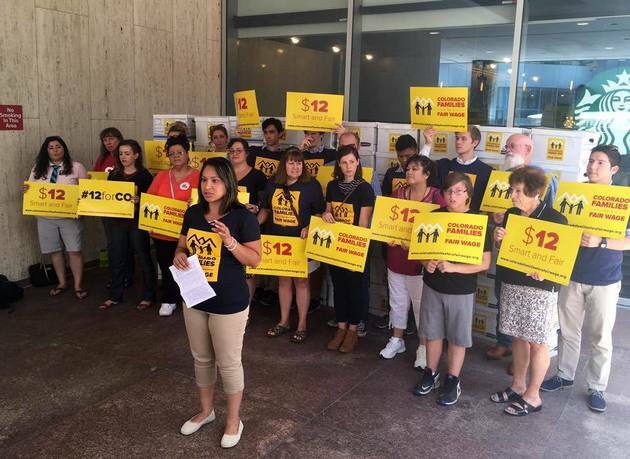 This week, Colorado Families for a Fair Wage turned in 200,000 signatures to put the proposed increase to $12 by 2020 on the November ballot. That number of signatures is more than double what is required, illustrating the broad support and widespread need for giving workers a raise. The minimum wage was created to help keep working families out of poverty, but the current wage of $8.31 hasn’t kept up with the cost of living, and it certainly hasn’t kept all working families out of poverty. Minimum wage workers with kids or a spouse to support are either essentially at the federal poverty line or well below it. Giving workers a raise is smart, and it’s fair. The ballot measure would raise the pay for the roughly 419,000 Colorado workers who currently earn less than $12 an hour, including one-fifth of female workers in Colorado. Four out of 10 workers who would get a raise are workers of color. Another 58,000 workers who earn slightly more than $12 per hour are projected to get a raise as employers adjust their pay scales to accommodate the higher minimum wage. A minimum wage increase clearly helps workers by paying them enough to meet basic needs. But workers and their families are not the only ones who will benefit. Raising the wage helps the employer because it boosts job retention and increases productivity — some of the reasons why the majority of small business owners support a wage increase. Plus, the state and communities stand to benefit because minimum wage workers put dollars right back into the economy. Low and middle-income workers are more likely to spend their pay increases and to spend them locally. Working full time at the current minimum wage is not enough to support the basic cost of living in most Colorado communities. No one who works full time should have to live in poverty. Raising the wage is the right thing to do for workers — and for Colorado. This topic contains 0 replies, has 1 voice, and was last updated by Elizabeth Owens 2 years, 8 months ago.